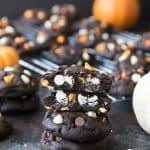 Dark Chocolate Halloween Chip Cookies have a super soft and black-as-night dark chocolate cookie base that is studded with sweet white chocolate chips and creamy peanut butter chips for a frighteningly delicious treat! These are such easy Halloween cookies to make! In a separate bowl, combine the Halloween chips, white chocolate chips, peanut butter chips, and mini Reese's Pieces and give them a quick stir so they are evenly distributed. Gently stir or fold in 1 3/4 cups of the chips into the cookie batter, setting the remaining chips aside in reserve. Scoop approximately 2 tablespoons of cookie dough for each cookie and shape into balls by rolling between the palms of your hands. You might need to refrigerate the dough for 30-60 minutes in order to work with it as it is a very soft dough, although I can usually skip that step as long as I work quickly. Once the dough is shaped, place the balls on the prepared baking sheet 2 inches apart and bake for 8-10 minutes, just until set. Do not overbake. As soon as the cookies are removed from the oven, press a few of the reserved chocolate and peanut butter chips into the top of each cookie. It's a total vanity move but adding the extra chips at the end makes the cookies look so pretty and festive. Transfer to a wire rack to cool completely and store in an air-tight container.